Some questions about the nature of the planet came about as a result of the last update. In particular, some questions were asked which, at the time, I didn't have an answer to. So I went and figured it out! 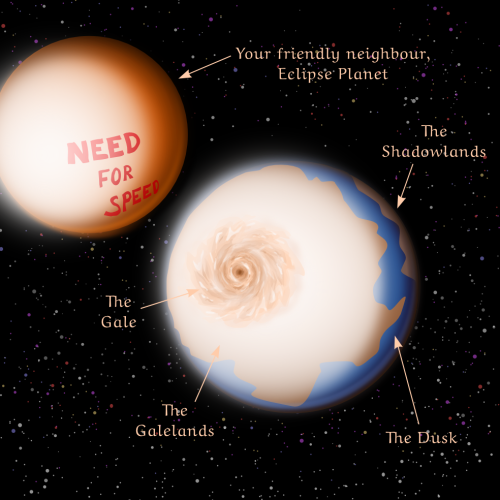 So, here's some information about the planet and star system in which Galebound takes place! First off, the planet Galebound takes place on is called Dusk. Originally it didn't have a name, but a region on the planet is called "The Dusk" and, by way of synecdoche, it became the name of the entire planet. Dusk is loosely based off Gliese 581g. One of the more interesting features of 581g and Dusk is that they are tidally-locked. This means that the same point on the planet is always facing another body, in this case their star (which, for the sake of the narrative, will be referred to simply as their sun, not to be confused with our Sol). With tidal-locking, nearly the entire planet is uninhabitable. On one side, you've got a good chance of spontaneously catching fire. On the other you'd freeze to death very, very quickly. These areas are respectively referred to as the Galelands and the Shadowlands. No one in their right mind lives there (for long, anyway). In the center of the Galelands is the titular Gale, a massive storm centered on the subsolar point. This storm is half of the planet's heat-distribution system (the oceans being the other half) and scatters heated air from the Galelands into the cooler Dusk and Shadowlands, keeping the Dusk nice and temperate. The Gale also has Important Magical Attributes which Din will explain sooner or later. tl;dr, it's important enough to appear in the title so it's pretty major. In between the two deathzones of the Shadow and Galelands is Conan and Din's home: The Dusk. It's a 800km band of land and sea trapped in an eternal twilit spring. They have no seasons (not enough planet-wobble) or even times like we do because of the tidal-locking. As you can imagine, this makes time-keeping a little difficult. Dusk's orbital period/year is 32 Earth-days, and their year is the same length as their day. Therefore, their real "day" is 32 Earth-days long, but that's just horribly inconvenient (Imagine a 768-hour Monday). In addition, there's no night or transit of the sun to set your clock by. Illustration courtesy of Bobblit of A Tale Yet Unclaimed, who also inspired this post with her questions. There's a riveting debate between astronomical scientists on the Dusk whether that planet that creates the eclipse is always the same planet. There's a theory that it's actually a pair of twin planets sharing the same orbit, putting their respective orbital periods at a rather-more-sane 2.5 Earth-days. In the middle of the "day", 581b is behind the sun so you can't see it at all. As the dark hour approaches, it slowly appears and grows larger in the sky (direction of approach depending where you are on the Dusk). From Conan and Din's current location, it approaches the sun from the "top left", if you're facing towards the sun/east. After the dark hour, it appears to shrink and vanishes out of view (if it doesn't dip below the horizon). This is why watches were invented early in this world because good-friggin-luck figuring out what time it is by the position of the sun and 581b most of the time. Woe to those who forget to wind their watch frequently. Conan never leaves his father's pocketwatch at home. That said, the eclipse planet doesn't feature largely in the story much other than when some darkness is needed, like in the upcoming chapter! It does, however, need a name. I am open to suggestions because I'm honestly drawing a blank. Maybe I'll be obtuse and call it (or them) Ombre (and Foncé). Hear that sound? That's the sound of those names solidifying themselves as canon.